Our adventures and experiences in American Samoa…and beyond! So many of you want to know about why I chose a natural childbirth. I didn’t think it would be so tricky to write about, but it has had me stumped for several weeks now as to how to explain my feelings. I’m pretty sure that this will be the longest post I’ll ever write. I have decided that I should write this post in the hopes that perhaps my experiences can help someone else. That is all. Everyone reading this needs to remember what a blog is for…expressing people’s personal opinions. In no way do I want to come across as judgmental, just as I do not want to be judged for my opinions. I do not think less of people who do not choose natural childbirth. I do not think I am someone special just because I did it. There are many women who may yearn for the opportunity to have a natural birth but for some reason, medically or otherwise, are not able to. There are many more who long to simply carry a child of their own, but are unable to. I have been there, and I remember the hurt. In no way do I want to offend anyone by what I write, especially when I talk about pregnancy and the blessings and learning opportunities that go along with it. Women are all different, too often we try to compare ourselves to others, to measure up to somebody else, but we’re just setting ourselves up for failure. We are not the same. We do not have the same challenges or trials. We don’t all have the same blessings and joys either. My thoughts here are for me, you don’t have to apply them to your own life. Please try and read this simply as my experience, the opportunities that have specifically come to me, and what insight I was able to glean from them for my own life. I believe that the family is central to God’s plan of happiness and that we can live with our family members after we die. I believe that God’s commandment to Adam and Eve to “multiply and replenish the earth” remains in force today, and that children have the right to be brought up by loving parents who are committed to each other, their marriage, and their children. I believe that parents have the responsibility to provide for the physical and spiritual needs of their children, and to teach them to be good people and citizens. I believe that families can be more successful when they incorporate faith, prayer, repentance, forgiveness, respect, love, compassion, work, and wholesome recreational activities into their lives. I try to base my goals and decisions around all of these beliefs. After our sixth child was born, I had some health struggles. I was battling lots of different physical symptoms and a few emotional ones as well, including depression. Fortunately for me, this only lasted a few months before I was able to be diagnosed with a thyroid disease. A small pill once a day and my world returned to normal, but not before I had come to the conclusion that my family was more than enough for what I could handle and that surviving each day was enough of a challenge for me. We decided that our family was complete, and felt fine about that decision. While all of this was happening, Michael received a very strong revelation in answer to his prayers of what to do. The answer blew both of us away, we were to have another child. What? No! Neither one of us could believe it, but after a few weeks of fasting, prayer, and meditation in the temple, we both knew that this was the right thing for our family, so we tried to have faith and forget our fears! A year passed, we were still not pregnant, and we were both silently relieved thinking we had passed the “faith test”. Then, another one came along. A job offer in American Samoa. Again, we reasoned that this was not the right decision for our family, and again (in a much clearer and personal answer), we received a witness that moving our family to American Samoa was the right thing to do. What? Seriously?…Yep. So, there we were in American Samoa wondering when this little baby was going to come to our family. Another year went by. Finally, we discovered that we were pregnant. Because so much time had passed, I think we were kind of relieved. I wasn’t scared to have another baby any more. I was totally healthy (ha! ha! ), totally sane (ha! ha!) and ready for another sweet child to join our family. The scary part for me this time around was the realization that we’d be delivering this baby in American Samoa where the hospital is a joke, and there are no epidurals! I had no choice but to prepare for a natural childbirth. I have a friend who is a doula and natural childbirth advocate. She has a birth story which was submitted for publication in a new book. I had been aware of this for a couple of years, and had been anxiously awaiting the publication. It was finally published in July 2012, just a couple of weeks after I found out I was pregnant. Coincidence? I think not. 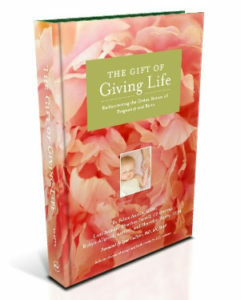 Introducing the book, The Gift of Giving Life (click on link to go to webpage). As the webpage says, this book doesn’t advocate for any one type of birth, but it intends to unify families and communities in regard to the sacredness of birth. It is a spiritual look at pregnancy, birth, and mothering for women of all faiths. Although most of the essays and birth stories are written by members of the Church of Jesus Christ of Latter-day Saints, the doctrines apply to all Christians, and even those of other religions who have faith. It’s hard to summarize this book or what I learned, I wish you could all get a copy and let you read it yourselves! There are chapters on the importance of giving life, personal revelation, patience, preparation, meditation, fear, pain, the atonement, and unity. In all of these topics, essays based on scriptural doctrine and personal birth stories spoke to me and changed my heart and my desires. In December when we discovered that we needed to leave American Samoa and that we’d be having the baby in the states, most people assumed that I would have an epidural, but giving birth naturally was my choice. I didn’t have to do it. I wanted to. I knew it would be a privilege. I felt like I had been saved, like my other four pregnancies had been missed opportunities, but I was being given one last chance. I had fallen victim to many others in this state or country where we hand all control and decisions over to our doctor. We assume that he knows best on every count, and we follow his directions like sheep. My last two deliveries were very much like this. Scheduled inductions on a day that was convenient for everyone involved, and then following the steps to get baby here, almost like a factory production line. I hadn’t thought anything of it at the time, and thought that those two births were very successful and easy. Not any more. I finally came to understand how sacred birth is, and what an amazing opportunity those of us who have the privilege of giving birth have to understand ourselves more as women and daughters of God. While pregnancy and birth are physical processes, they can also be deeply spiritual. As I read and studied about the faith of women in the scriptures, I felt empowered. I knew that God would fortify me with the strength and courage to do this divine thing. He designed my body to be able to do this. Childbirth is a sacred event that is intended to turn our hears and minds, and even bodies to the Savior. Heavenly Father created women. He could have designed a way for children to be born without pain, discomfort, and agony. We can only presume that women have the opportunity to gain something from the experience. Giving birth strengthens our love of Jesus Christ. The act of experiencing pain for the sake of another helps us understand the Atonement better. Christ came to a point in the Garden of Gethsemane where He would rather not have gone through with it. Yet, He humbly surrendered His will, and that is when His Father sent an angel. Elder Holland said that we have the right and opportunity to call on unseen angles to assist us, and that the power of heaven stands ready to render aid to a life-giving mother. In any situation, when we follow God’s will for us we should be praying not for our circumstances to be changed, but for strength and courage to be able to handle those circumstances. Although I knew that it was possible that God could take away the pain of childbirth, that was probably not His plan for me! My prayers were pleadings to be given the strength equal to what God was asking of me. I needed to be willing to submit to all things which the Lord saw fit to inflict upon me. I needed to have integrity during my pregnancy. For me, this meant not deferring all decisions to my doctor. It meant having confidence in what I knew was best for my body and my baby. It was difficult to do this when I got intense pressure from my doctor to get induced early (solely for his convenience). There were no health problems for me or the baby, but he was brutal about it. On two visits he reamed into me for not doing things his “production line” way like I had done in the past. He was certain that I would have a “natural experience” if I’d just let him break my bag of waters and start me on pitocin at 39 weeks. (Yes, I cried in the parking lot afterwards). It was really hard, but I knew how I wanted to deliver this baby, and that wasn’t it. I went into labor at 41 weeks on the day he left town (another miracle) so I didn’t have to deliver with him. I delivered with a stranger who couldn’t have been more perfect. She let me labor exactly as I wanted and was completely supportive of my decision to give birth naturally. One of the things I liked in the chapter on pain was the advice that your body will tell you what position is ideal for labor, and to just follow what your body wants. Again, I count it as no small thing that for me, the only “comfortable” position for me during contractions was on my knees. This whole pregnancy and conception for me (all three years of it) was about submitting to the will of the Lord. How appropriate that during the most intense parts of labor, I fell to my knees. I spent the whole labor communicating to my Father in Heaven through prayer and asking him to give me strength. I remembered the scripture, “If ye have faith in me ye will have power to do whatever thing is expedient in me”, and it was true. I could do it. It wasn’t easy, it was very painful, and at times when I was alone to deal with the pain (driving in the car to the hospital) I was able to call on Elder Holland’s promise above and receive additional power from heaven. In Enos 1:12 it says, “And it came to pass that after I had prayed and labored with all diligence, the Lord said unto me: I will grant unto thee according to thy desires, because of thy faith”. My desire in choosing a natural childbirth was to fulfill and more fully experience my sacred role as a life-giver. I wanted to draw closer to the Savior and understand the Atonement more. I wanted Heavenly Father to accept my sacrifice and my faith as signs of my love. I know that the effort that I made was pleasing to the Lord. I know that I could not possibly have done it without the divine help and strength that I received through the atonement of Jesus Christ. I know that because of His atonement, I can not only be forgiven for my many sins and wrongdoings, but I can also use this enabling power to do good works, try to be a better person, and ultimately receive exaltation and eternal life. I am so grateful for grace. That was beautiful. Thanks for sharing. Thanks a lot for posting this and i do believe it’s helps me a lot, and who ever out there struggle in life. i can’t wait to read the book..Loads of love.. I was able to use natural childbirth with 5 of my 6 children and felt blessed that I was able to do it. I strongly recommend it to Other new moms. But, I have been present at the births of several friends and my daughter-in-law. I’ve seen that it isn’t an option for everyone. Due to complications with my sixth birth, I was just happy that the baby and I survived it. Trust me when I say that nobody was happier than my poor husband who briefly wondered if he was going to be left alone with all these kids. When people ask my advice on birthing children, I personally think its a blessing to go through natural childbirth if possible. If not possible, then have the best experience possible. I think it’s like lots of things about bing a mom- there is the ideal experience that many people would choose, and then there is what you get when it doesn’t go the way you would choose. In the end, we just have to treasure our experiences and make the most of each day. It’s wonderful that you chose to name your baby Grace. A good reminder that none of our lives are perfect, as much as we might like them to be. Each of us must rely upon grace and the saving power of the Atonement. I hope your little Grace treasures her name. Thank you Sheridan. I really loved your essay on “Power, Love, and a Sound Mind” from the book. It really helped me to overcome my fears about child birth, and most importantly, it gave me the peace and confidence to hire a doula and feel comfortable with that, no feelings of guilt for not using my husband as the birth coach. What a beautiful post. It means so much to me as one of the authors to hear your thoughts upon reading our book. It was truly a labor of love. We felt God’s hand in influencing the words on the pages. I love that you said this, “I count it as no small thing that for me, the only “comfortable” position for me during contractions was on my knees. This whole pregnancy and conception for me (all three years of it) was about submitting to the will of the Lord. How appropriate that during the most intense parts of labor, I fell to my knees.” There is so much to ponder and learn from our birth experiences. Thank you so much Robyn. It is such a privilege for me to hear from you and Sheridan. I look up to all of the authors so much. I can’t tell you how many of your words and counsel I have underlined and some memorized from your book! I love what you taught about preparation, obedience and strength. I love your views on angels, I didn’t write too much about that, it’s so personal, but I know they are there to help us too. My favorite essay of your was the one on the Atonement. Thank you so much. Thanks to your efforts to research and put all of the scriptures and quotes in one place, you made it so easy for me to understand something that I should have realized a long time before. I feel like I know you! Thank you for your part in giving me this most wonderful experience. lovely post. sounds like the first chapter for “the gift of giving life, vol. 2”. So eloquently stated, Helen. Congratulations again and thank you for all the insights.